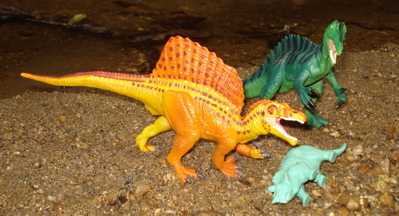 The Spinosaurus is unique among the Dinosaur toys. 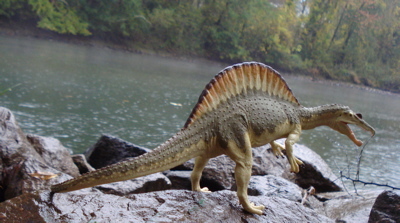 with its tall spines along its back, makes for a very interesting member of the Dinosaur toys family. The elongated skull provides interesting interpretations and the "sail" makes for a multi-colored palette. We of course have no idea what color these were and in the area of Dinosaur toys they range from the bland gray of the Papo Spinosaurus to the bright orange Safari. From the 1996 Carnegie Spinosaur wrestling over a fish to the 2008 Carnegie version contemplating the river to the quite pleased 2007 Papo Spinosaur at the market shopping for dinner. 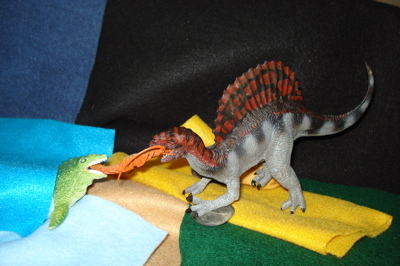 There are a variety of excellent Spinosaurus Dinosaur toys choices available to both the contemporary collector and consumer. which is not much solace. The Spinosaur can be considered to have filled much the same ecological niche that today's Grizzly Bear occupies. 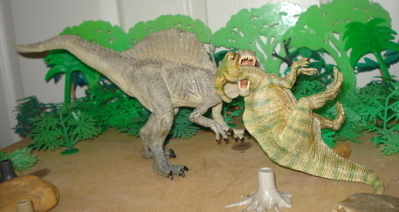 You can learn more about Spinosaurs here. 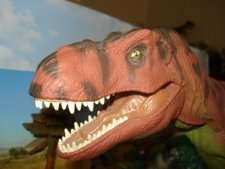 You can find other companies that make great Dinosaur toys as well as a great overview of the history of Dinosaur toys at the Dinosaur Toys Collectors Guide.